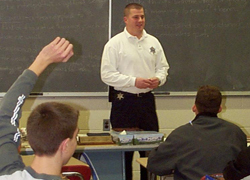 The Dutchess County Sheriffs Office School Resource Officer Program has been used as the national model. It is operated as a proactive initiative based on prevention, education, and intervention where specially trained and experienced Deputy Sheriff’s are placed in our schools on a full-time basis. Creating a safe school environment conducive to learning. Promoting awareness of the law and other safety issues to foster responsible citizenship. Serving as a confidential advisor, a source of counseling and a link to support services. Bridging the gap between youth and law enforcement thereby establishing a trusting channel of communication. Assisting administrators in implementing SAVE legislation requirements. The Deputy Sheriffs assigned as School Resource Officers conduct community outreach and crime prevention programs as well as act as a liaison between the school community and Dutchess County Sheriff’s Office. Police Officer sworn to maintain peace & order. Provide a visible deterrence to crime. Provide police services & serve as a member of safety teams. Assist in SAVE legislation and crime reporting requirements. Maintain an open door policy and be an "active listener." Be a “reality counselor” and provide referrals to appropriate services. Advise on certain criminal justice issues. Presentations for students from kindergarten through 12th grade on a myriad of topics. Presentations for the faculty & staff on law, school safety, violence, and substance abuse issues. Presentations for parents and community groups on law, safety, and crime prevention issues. Crime Prevention in our Communities. Crime Prevention is the focus on strategies that help prevent crime, reduce fear of crime and improve the quality of life in our neighborhoods.